There is not a lot to say about this one really. It is a gift bag |I altered using up bits from my stash. You will see three different papers were used, and yes they were scraps from my stash. The lace and trim are both from my stash and the flowers are from Noor Design UK. I can just imagine the delight in receiving a gift in such a lovely bag Judy. 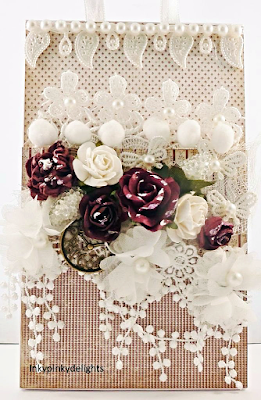 Hi Judy.....You showed us so many gorgeous cards or little projects as the gift bag you show us today. It's so fantastic to watch all the gorgeous embellishments you use....the lovely lace....Full cards, just as I like it but it is lovely to see how you add a lot to your creations and never gives us the feeling it's not okay....It's so perfectly ordened and designed...I hope I use understandable english ....lol.....but....I am sure you know what I will tell you...... I JUST LOVE IT ALL.....!! !